Factory automation design often starts with a desire to increase productivity. By improving your factory automation line, in addition to increasing productivity, you can also increase your quality and overall output. During our factory automation design process, we can customize the size and shape of your automation system to fit into your plant layout and to integrate into your existing assembly lines. Your existing building is an important factor to take into consideration and we can build around structural elements, while still creating an efficient automation system. At Dial-X Automated Equipment, Inc., all of our machines are also designed to save on floor space, as well as to reduce air and electricity consumption. In our factory automation design process, we work directly with our customers to discover their needs, goals and expectations for their new system. We can design to our customers' specs or we can help establish the design specs for the system. 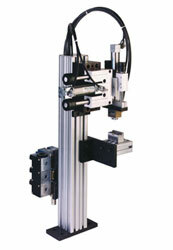 For further information or a free quote on factory automation design, contact Dial-X Automated Equipment, Inc.